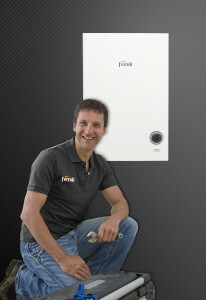 You are in: Home › News › Why installers love Installersmate.co.uk! Time is money so the fact that Installersmate is so easy and straightforward to use is a great bonus on a busy day. Making a Gas Safe notification and registering the warranty after the installation of a boiler are vital actions that must be taken and the fact that Installersmate allows both to be done in just a few clicks means installers are saving time, saving money -because Installersmate picks up the £2.20 Gas Safe Register fee – and getting immediate peace of mind that their obligations to Gas Safe and the customer have been fulfilled. Instant production of the Gas Safe notification and warranty certificates is also a great boost to productivity. A quick check on their profile shows the installer all the certificate pdfs for all their installations, old and new, and speedy despatch by Ferroli’s customer service team of the certificates to the customer cuts out all those time-consuming phone calls from customers asking when their certificates are going to arrive. The next benefit that Installersmate members have yet to enjoy is our clever email reminder service for their customers’ annual boiler services. Six weeks before the anniversary of the installation both the installer and the customer will automatically receive an email from Installersmate reminding them that they need to contact each other to book a date for a service. This is so important for the continued smooth safe running of the boiler and to maintain the validity of the warranty and it means the installer retains the business and doesn’t lose out to a competitor because he forgot! So we’d like to say a big thank you to all Installersmate members who’ve taken the trouble to contact us with their kind words and questions; and to anyone who’s reading this and hasn’t signed up yet – come on in and join the club!